getawaybunny – ISO perfect getaways, for an hour, a weekend, a month, or until your boss comes looking for you. ISO perfect getaways, for an hour, a weekend, a month, or until your boss comes looking for you. GB Quickie: Southwest Airline Video MUST SEE! Yeah, regular Bunnyists know that we’re big fans of Sunshine State exploration. We’ve scoured the lower Keys, braved Orlando in season, and have contemplated a permanent hideout on the Gulf shores of Anna Maria/Longboat/Sarasota area. But there’s more coastline in Florida than in any other state in the union, so in October we dusted off our Lewis & Clark membership cards, hitched up the Bunny Wagon, and aimed south, this time for points not yet traveled. Fall is our favorite time of year to visit Florida–the crowds are smaller, air and water temps are still in the 80s, and pricing tends to be less expensive (although that definitely seems to be trending for the worse). Mrs Bunny’s research was stellar as usual, and we ended up on the Space Coast barrier island of Cocoa Beach. If you’re like us, your Cocoa Beach awareness comes almost solely from re-runs of the classic 1960s TV show “I Dream of Jeannie”. Much of Cocoa Beach still holds fast to that Old School Florida look & feel, with snazzy classic beachfront properties that seem perfectly suited for a bartender who’s well-versed in proper Rob Roy, Manhattan, and Whiskey Sour mixology. You can practically hear the big brass jazz music wafting in the breeze. Like much of the mid-and upper part of Florida’s Atlantic side, the Space Coast is decidedly devoid of the South Beach glitz & glamor, which is just fine by us. They have a passion for strip clubs (we counted 4 within a few miles of our condo), barbecue joints (at least 5), and Thai restaurants (6+). Cocoa Beach is also the East Coast’s surfing epicenter, um, dudes. Every day, dozens of boarders were out there doing their thing as the sun rose, which also lent that 1960s mood. Lessons, board rentals, and surfer lore were rampant all over town. It’s also easy to reach. The closest airport is Orlando, about 50 minutes northwest (as are the Big O’s theme parks, if you’re so inclined). If you’re driving down, Cocoa sits about 15 minutes east of I-95, an hour or so south of Daytona. As usual, we steered clear of the whole hotel/motel thing, and went condo. Mrs. Bunny worked her magic, and decided on Chateau by the Sea (5300 Ocean Beach Blvd, Cocoa Beach), a cheesy-named yet unassuming 5-story direct oceanfront property with off-street parking and heated pool that’s just steps from the famed Cocoa Beach Pier (more on that later). Our condo was a top floor end unit, with two bedrooms, two full baths, washer/dryer in unit, full kitchen, two balconies, amazing panoramic views, and free wi-fi. 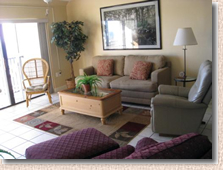 The unit was clean and decently furnished, and even had a walk-in closet loaded with beach stuf. With October pricing, this gem set us back just $100 per night. In our book, that’s a GB No-Brainer. In fact, it was so inexpensive that we kept waiting for the other shoe to drop: insect infestation, loud neighbors, sulfur water, poltergeists? Nope, none of the above. It really was absolutely fine. Even our bed was comfortable. The Cocoa Beach Pier was right there, and as kitchy as we’d hoped. Does this look like a $100/night oceanfront condo? There were a few mildly wacky things. For one, the shower curtain/rod in the master bath fell on our heads a few times while bathing. And not that we saw a gathering of interlopers (or any, really), but in order to get to the beach, you have to do this Get Smart operation of a key-lock gate leading into the pool area, circumnavigate the pool, and then unlock a second gate to reach the sand–a juggler’s challenge when you’re laden with sand chairs, cooler, beach bag, umbrella, etc. Still, that’s nit-picking of the first degree. We’d absolutely return, and with smiles on our faces. Yeah, honestly, the cutesy name scared the hell out of us. But after several locals pointed us that way, we listened. And we’re glad we did. 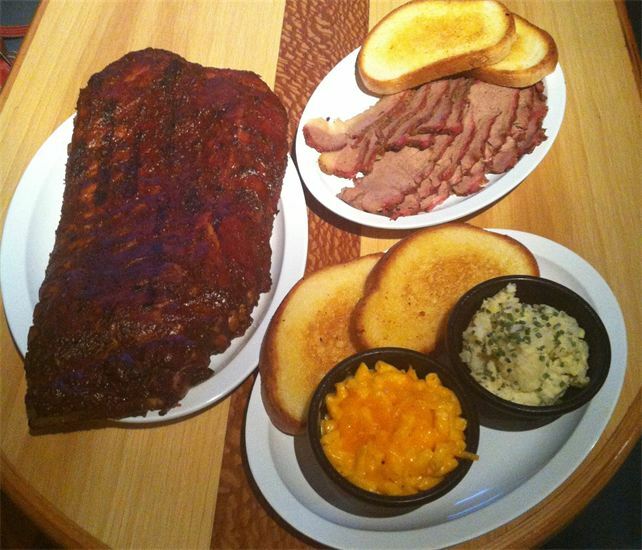 Mad Jack’s is as real a barbecue joint as any we’ve found in NC, TX, or beyond. It’s sooo not the tourist trap we were envisioning, either. The owner was warm, laid back, and welcoming, and when he found out we were first-timers he had the server bring out samples of their pulled pork, brisket, and tri-tip for the table. Each were fantastic, and down-home authentic as a bar fight. They also make their own sauces (sorry, Aramark), which were equally amazing. But be warned: their “extremely hot hot sauce” lives up to its name. 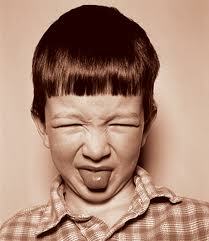 Our oldest son had it on the Maverick Burger (which also features fresh jalapenos) and was sweating when he was done. The deadly sauce is so dee-lish that we ate it til we were mouth-on-fire like Lloyd and Harry, stopped til the heat went down and, then went right back for more. We love joints like these. Sensing a theme here? 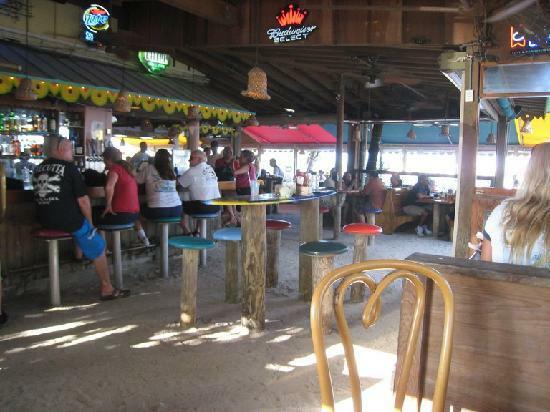 We didn’t find a preponderance of fine dining whilst in the area, so when in Rome…The Sandbar is a classic beach shack dive, with great wings, huge sandwiches, and an extensive drink menu that would even keep Ozzy busy for awhile. The “Cat 5” Hurricane is mixed with five different rums (including Bacardi 151), yet went down smoothly, although it did strip some of the varnish off the table when I spilled a bit. 3ARides (210 N. Orlando Avenue 321-868-8820) 3A offers private and group surfing lessons, and board and bike rentals, and the owner was a wealth of knowledge of all things Cocoa Beach. Our youngest (the athlete) went out with an instructor, and after a few expected wipeouts he was riding freely. We rented a board for him to try for a few days for around $50. Another point worth noting–we bought a few 2-for-$10 T-shirts with their logo on them. On the first wearing, one of them tore like I was wearing Kleenex. Given the price point, I didn’t expect much retribution, but after reaching out to the owner and letting him know what happened, he explained there was an acid washing error, apologized profusely and shipped two us new shirts that so far have held up just fine. Well done, sir. Ron Jon Surf Shop (4151 N. Atlantic Avenue 321-799-8888) Iconic Ron Jon now boasts 12 locations up and down the East Coast, but this is the very first one. What started out as a simple shack has blown up into a superstore and attached resort, kinda like South of the Border without the urine smell. Prices are high, and the place is packed with surfers, surf posers, and general tourists, but there’s plenty to see and buy, and is worth at least a brief visit. 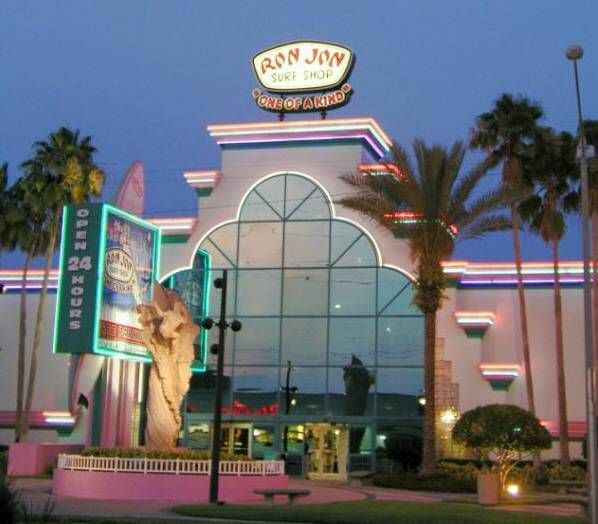 The original Ron Jon surf shack has grown a tad. Cocoa Beach Tennis Club (Tom Warriner Blvd, off Minutemen Causeway 321-868-3224) Tennis in Florida is a beautiful thing, which is why so many pros and coaches call it home. The Cocoa Beach Tennis Club is owned and run by the city’s Parks and Rec Dept; a first class facility that blows away the private clubs back home. CBTC has both clay and hard courts, as well as a pro shop, stringing, lessons, and a small clubhouse. Membership DOES get you a price break, to be sure, as does being a resident. But the price for non-member, non-resident players? A paltry $7 per 90 minutes for clay, or $4 for hard court per player! To compare, Cross Courts in Easton, MD charges more than $30 per hour per court for non-members, with no clay. Plus, the CBTC staff was laid back, and super-easy to work with. 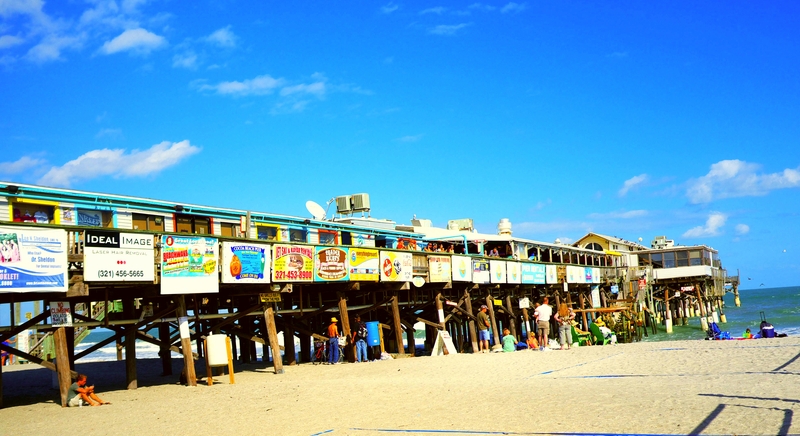 Cocoa Beach Pier (401 Meade Ave 321-783-7549) This is a true slice of old school Florida. Walk onto the pier, with its collection of gift shops and food spots and it’s the Nixon Era all over again. Most of the pier is free to see, but it’ll cost ya a mean $2 to go all the way out to the end and spectate where the fishermen are doing their thing (you sort of need to meander to navigate your way out there too). But there’s a sweet little tiki bar out on the tip (be sure to ask for a “real” margarita) and live music in the afternoon, not to mention a Grade A people-watching opportunity. Mangoes @ International Palms Resort (1300 N Atlantic Ave 800-916-4339) We passed this place on the main drag all week long, and the “Live Reggae Music Every Sunday Afternoon” sign lured us more every time we saw it. Come on, Sunday!!! 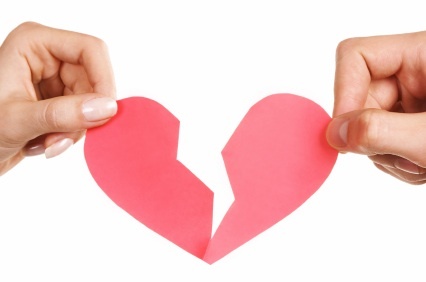 But such is life that the expectation never came close to the reality. Mangoes is a beach bar attached to an aging “resort” hotel that had a 1980s heyday feel to it, at least on the outside. The bar itself is technically on the water, inasmuch as there’s nothing between it and the Atlantic, which is sorta over there. Walking in, we immediately picked up the scent of Ultimate Tourist Trap, but still, margaritas and reggae music were beckoning. So we found a table (place was maybe half-full), ordered drinks from sticky menus (I hate that), and took in the surroundings. First of all, the reggae was only half-live: two guys in bad Hawaiian shirts; one with an acoustic guitar, the other playing keys, with a pre-recorded backing track that sounded a lot like the organ store in the mall. No, we weren’t expecting Toots & the Maytals, but this was as true reggae as Taco Bell is authentic Mexican cuisine. We sat through versions of ‘Red Red Wine’ and ‘I Shot the Sheriff’ that would’ve bored Mormons, and our cocktails and server were still MIA. So I went to the bar and explained our situation to the two tenders chilling out. One of them assured me that our waitress would be “right over”. ‘Right over’ is, of course, a relative term. Ten minutes later, we were still high and dry. And done. Mrs. Bunny told the bartender to cancel the order, and we split and went to the Sandbar instead. Maybe Mangoes’ food and drinks were amazing, and maybe Damien & Ziggy Marley sat in for the 2nd set. We’ll never know. Cocoa Beach is a solid go-to for a family getaway. Water was warm, and the easy waves make it a great place to learn to surf. If you don’t require fancy, or have the need to see a Bentley Continental on every street corner, Coca is nice, reasonably clean, affordable, and rife with food and stuff-to-do options. It’s also a great spot to put a drink in your hand and your toes in the sand and simply watch the surfers surf, the pelicans dive, and the cruise ships come and go. Yeah, normally we try to steer clear of sounding like salespeople, but the Alaskan Cruise deals we just received made us do a double-take. 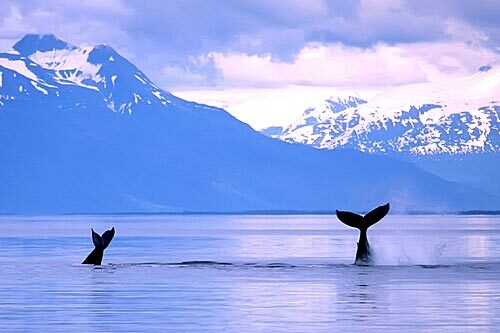 Honestly, Alaska should be on every serious traveler’s bucket list. For East Coasters with a penchant for palm trees and tiki bars like Mrs Bunny and me, the 49th state was like visiting another planet; epic, breathtakingly beautiful, and perfectly pristine and undisturbed. It wasn’t quiet, but there was very little red noise–the sounds didn’t much come from anything man made. In fact, GB contributing writer Robin Heyser was so smitten, she disappeared into the landscape for three solid months, living off the land like Grizzly Adams. 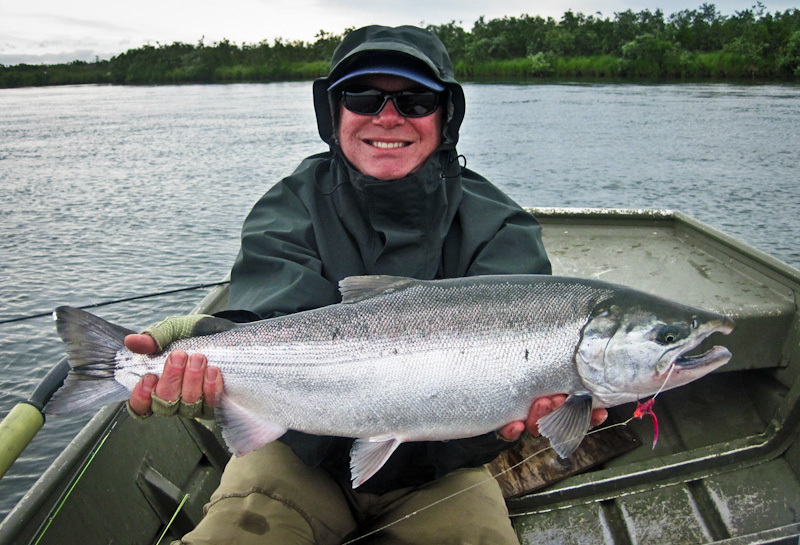 We saw glaciers like giant ice mountains that popped and cracked like gunshots, lakes so clear the water was actually invisible on calm days, and wildlife from bears to wolves to caribou to eagles to seals to moose to salmon the size of a canoe. The ships set sail from Vancouver, British Columbia, one of the most beautiful cities in North America, so you’ll need your passport. Fly there directly, or land in Seattle instead to enjoy the amazing two hour drive north with expansive views of Puget Sound to the left and massive Cascade Mountains on your right. 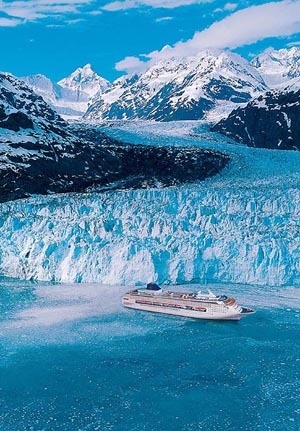 Click HERE for bitchin Alaska cruise deals. Click on the link below and enjoy this vid of a Southwest Air flight attendant adding a human element to the usually saltine-dry pre-flight announcements. And if you have friends with American, US Air, United, or other airlines, please forward this along to them. Who knows? Maybe the concept of hiring people who actually dig their job might catch on. Put away your (electronic) toys! Pay attention! I’m giving my lesson on how your seat belt operates! Our recent jaunt to Key West via American Airlines was a round-trip dignity mugging. 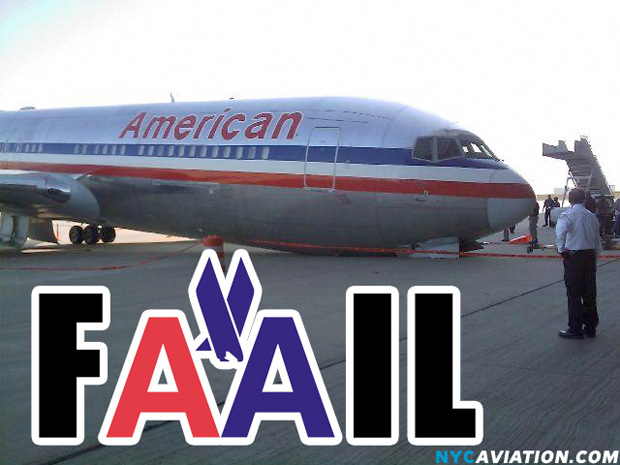 For starters, it’d be great if the nice big airplane company could possibly hire customer service personnel who don’t positively hate their jobs/their life/anyone not wearing an American Airlines uni. Seriously, I’ve seen more enthusiasm in a cemetery. I’m not saying they were disparaging, but they looked at us like Hillary Clinton would regard a used condom stuck to the bottom of her shoe. If my first sensible boarding reform plan doesn’t work, then why not attach jetways to both ends of the plane? There’s two doors, Mr. Hawking–use them. Easy on, easy off, for everyone. Airports have more jetways than they know what to do with. I think they actually breed them when no one is looking. Rows 1-20, to the left, 21-40 to the right, thank you ma’am. And it makes departing the plane that much easier, too. Let’s face it: if you’ve ever been in the back of a crowded 767 that’s just landed late and you know you’re going to have to run like Forrest Gump to make your connection, seeing the massive, slow-moving blot of bodies blocking your only way out is enough to make you wish for an Acme Insta-Vapor Death Ray Gun. Every airline we’ve used has some zany way of separating passengers at boarding time. Southwest has their letter grade A, B, Cs that always makes me wish I’d studied more. American boards by Zones, 1 through 5. Zone 1 seems to always be reserved for people who are desperately trying to look busy and important. We are neither, hence we’ve never even sniffed the 1 Zone. In fact, we checked in a full 24 hours before our flight (as responsible travelers do), and were still relegated to Zone 5. While waiting to board, the woman at the desk announced that “anyone who does not have a zone listed on their boarding pass may board with Zone 4”). Zone FOUR??? Exactly how far down the passenger food chain are we Fivers when we’re forced to board AFTER the people who didn’t even bother to have a zone assigned to them??? Do we get an actual seat, or are they tying us to the landing gear? Then there’s the two boarding lanes at the gate. I love this. 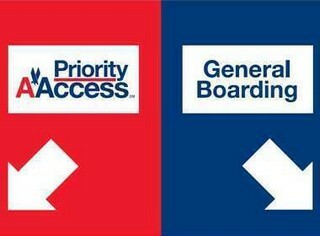 There’s one lane for General Boarding. It’s maybe 20 feet long, and seems to be doing its assigned job just fine. But right next to it is a separate special lane reserved for the First Class and Elite Master Express Credit Grand Poobah whatevers. It too, is about 20 feet long, and to my uncouth eye looks an awful lot like the one next to it. Actually, they’re identical, and separated only by a thin plastic belt attached to a couple of snazzy, burnished metal, thin plastic belt-holder poles. Is this really the best use of space? Does the preferred lane feature lilac-scented air as you navigate its majestic 20 feet of carpet? Are there massaging foot warmers under the flooring? On the return flight, we’re right back in plucky Zone 5 again, boarding behind mannequin parts and potted plants. As we approach the departure gate, Ms. Someone-Peed-In-My-Shoe-This-Morning informs Mrs Bunny and me that we “may” need to check our carry-ons as the flight is full, and space is limited, and of course, we’re careless enough to have allowed ourselves to be placed in Boarding Zone 5. The rules of what items passengers can bring aboard are stated approximately every 1.4 seconds in the terminal. We now know them better than we know our own pants size: one (1) carry-on suitcase that must fit in the overhead compartment, and one (1) personal item that must be small enough to fit under the seat in front of you. There are a set number of seats onboard, and a specific size limit for each carry-on. So how exactly do you run out of space??? Are the Flight Attendants smuggling massive Tupperware containers to 3rd world countries? She didn’t elaborate, so I grumbled across he tarmac with our bags, expecting to be surrounded at gunpoint by the luggage police at any moment. As we boarded the plane, I spied vast empty space in several of the First Class area’s overhead compartments, and quickly hoisted our carry-ons up and in. About then, the flight attendant huffed “sir, these are reserved for our First Class passengers” as if I’m sitting on their laps and going through their pockets. I looked around and all the FC seats were full. No other busy+important passengers were joining us on that flight. Yet there was still enough room even after our bags went in for Warren Sapp to climb up there for a long nap. With a yak. She relented. And I still wanted my rum. But next time, we’re giving serious consideration to selling off a few lesser-used body parts and using the proceeds to buy into one of those private jet time shares. Maybe we can look busy and important to each other? Offseason is an excellent time to hit the beach (area). Just got back from our annual Thanksgiving weekend pilgrimage (ha!) downy oweshun, hon. We’ve been visiting the beach on TG weekend since the kids were small, and during that span the Ocean City/Rehoboth Beach corridor on Thanksgiving weekend has gone from semi-ghost town to mega-packed. The bloody battlefields of the tax-free outlets make Braveheart look like a Disney film. Here’s some of the new discoveries we’ve….uh…discovered, good and bad. This time out, we decided to try the brand new Hyatt Place in the middle of Dewey Beach, DE (1301 Coastal Highway, Dewey Beach, Delaware Tel: 302 864 9100 $130 nt + tax). This three story ultra-modern monster is art museum slick, and sits in stark contrast to the old school, salt worn down-hominess of Dewey. Frankfurt Germany would be proud. Hyatt Place is thoroughly 3rd millennium both inside and out, with a glass & chrome design that feels more Frankfurt, Germany than mid-Atlantic beach town. Our room was large and well-appointed, with HD TV, mini fridge, sitting area, and a unique frosted glass slider leading to a bathroom that was snazzy enough to star in a Daft Punk video. That’s about it for the good news. The hotel sits on the bay side of Route 1, but has seriously limited views of anything bay-related. Plus, it’s pretty clear that they cut design costs when it came to noise suppression. The place is LOUD. We were awakened at 7am this morning by random continuous banging from an undisclosed location (we were on the top floor, so it wasn’t above us, either), and the people across the hall seemed intent to see just how loud they could slam their room door–repeatedly–all morning long. So much for sleeping in and taking advantage of the 12 noon checkout time. In all, it felt very Days Inn, and not at all what we’ve come to expect from a luxury brand like Hyatt. Other weirdness? There’s no non-emergency staircases, so apparently the Hyatt wants us all to be fat and slovenly. The place only has three floors; we’d prefer to walk up. Instead, two small elevators are the only way to get vertical, and when we headed down for breakfast this morning, we found a good 30 people clamoring in the lobby to go back up. Total cattle drive; not well-conceived, and totally unnecessary. In all, Dewey’s Hyatt Place was mostly a swing and a miss. Decent rate for a holiday weekend, but the property felt like a cheaply-made, entry level subcompact by a luxury automaker that was long on pomp and short on execution. Our advice: spend the extra coin and book at Rehoboth Beach’s Bellmoor Inn instead. Infinitely more quiet and intimate, service that’s far more personal and less Best Buy, and a complimentary breakfast that’s miles ahead in both quality and delivery. Back in September, we had a last minute chance to spend a warm weekend in Ocean City, and we did. 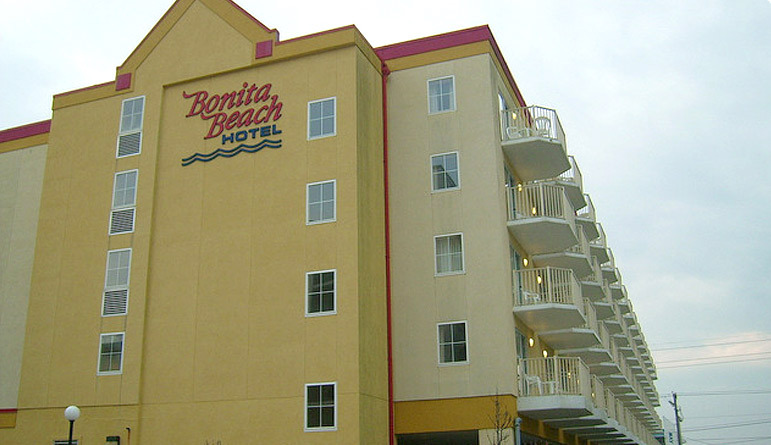 As it was still summertime, all of our favorite places to stay were already booked solid, but we found vacancy at Bonita Beach (8100 Coastal Hwy, Ocean City), a small sand-colored hotel in north midtown on Coastal Highway. The mere fact that this property still had rooms available was a red flag on its own, but a bad day at the beach still beats a good day at home so posterity dictated that we go for it. We bet this place was stellar in 1992. We never did find out what year the place was built, but it was probably quite the showplace back in the early 90s. Bonita Beach sports a true Melrose Place-era decor, but these days it’s aging and sagging, looks like its best days are behind it, and smells like stale menthol cigarettes–a lot like Keith Richards. Mrs Bunny and I managed an ocean view room with two queen beds and a small balcony for us and the two youngins. The ceilings were stained, half of the Liza Minelli bubble light bulbs in the bathroom were burnt out, and the tub’s poor drainage led to back-flow gray water enveloping our feet when we showered. But the best moment was when we were walking through the main floor parking garage under the building, and a big, nasty dollop of air conditioner condensation slopped from the ceiling above us and right into my son’s latte (bloop!). Legionnaire’s Disease, anyone? Here’s some other standouts down at the beach that we’ve never touched upon but are worth checking out. 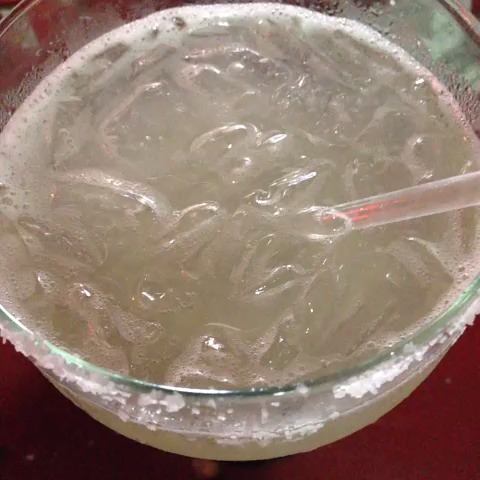 Mother’s Cantina (2812 Coastal Hwy, Ocean City 410-289-1330 ) is small and less than gorgeous, and resides in a small and less than gorgeous strip center on the main drag, but serves up excellent margaritas and Tex Mex home cooking that gives uptown rival Tequila Mockingbird a real good run. If you like things truly spicy, the Red Hot Burrito is mouth-watering (and mouth-melting too). Their En Fuego sauce packs serious friggin heat–you’ve been warned. If you visit Mother’s on a weekend, be prepared to wait. But that’s cool; the bar is long and the drinks are good. Fresh ingredient margarita. Take a sip. 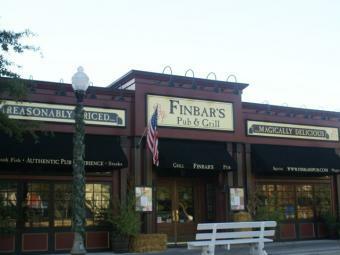 Finbar’s Pub & Grill (316 Rehoboth Ave, Rehoboth Beach 302-227-1873) is a fairly authentic Irish watering hole (for a beach resort) that does a solid job across the board. When we found our that their trendy next door neighbor Dogfish Head Brewery had a 35 minute wait last night, we gave Finbar’s a shot and we’re glad we did. Their Whiskey Wings were a potent combination of spicy and sweet, with a fantastic house made sauce featuring fresh ginger, chilis, and Jamison Irish Whiskey. They were so good, we ordered a second round. Likewise, the Maryland Crab Chowder had a thick, chunky tomato base, and was well-stocked with crabmeat. If you’re jonesing for Dogfish Head brews, don’t stress. Finbar’s has them, draft and bottled. And guess what: they’re less expensive than they are next door. Don’t bother going next door to Dogfish Head. The entire Getaway Bunny team wishes you and yours a very happy and festive holiday season! Everyone has at least one: a go-to restaurant you adore, that serves as the setting for everything from special occasion dinners to a sweet little lunchtime or after work diversion. 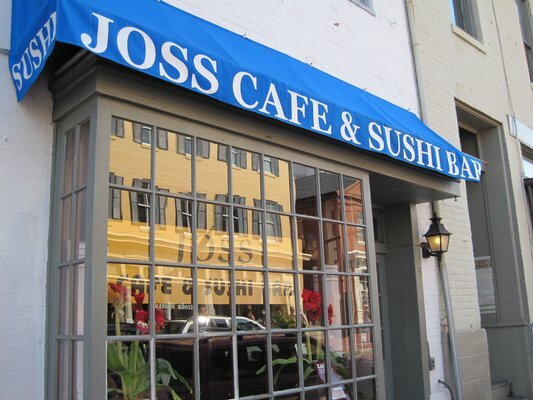 Since 1995, Joss was our setting for countless birthdays, anniversaries, and business deals, offering fresh, mouth-watering sashimi and nigiri, dee-lish rolls, tempura, and the best miso soup we’ve ever tasted. Over the years we watched Joss grow up, from the tiny little spot on Main St that previously housed French fave Cafe Normandie back in the 80s, through numerous expansions and the addition of a 2nd location in Baltimore. It’s long been our spot to impress out of town guests, as well as our top GB recommendation for anyone visiting historic downtown Annapolis. Here in 2013, the good news is that the Joss fare remains as marvelously and consistently good now as it was in the beginning. But beyond that, Joss has sadly matured into an absolutely unforgivable mess when it comes to customer service, trending further and further south of competency on each of our last several visits. Mrs Bunny and I stopped in recently, on our way home from an O’s game, the lure of the food and our long history with the place more than enough reason to look beyond recent disappointments there. Saturday summer evenings are always insane in Naptown, but we found parking without too much cursing, close by on State Circle, and walked over to see the usual crowd out on the sidewalk, waiting for a table. Joss has fastidiously never taken reservations, but in the old days, you could give them your name and then pop down a few doors to Castle Bay Irish Pub for a pint or two and someone would eventually come down and get you when your table was ready. The volume Joss does these days makes that concept an impossibility now, but you’d think that amidst all of their multiple build-outs they’d have added their OWN bar at some point for patrons waiting on a table. And you’d be wrong. We were told that the wait for two would be about 15-20 minutes, and then hastily directed to the “waiting room”, as if we were visiting the dentist. Picture a back room full of hungry people all doing a Pavlovian drool stare at their menu slideshow on the small wall-mounted TV. Cocktails are technically available before you’re seated, but you order them at this funky server stand thing on the opposite side of the restaurant from the designated waiting area, and someone eventually delivers them to you (in theory). Honestly, the whole waiting ordeal is just plain wacky, and ripe for improvement. Bear in mind that the entire original dining room now serves as just the hostess foyer, and said waiting room is now what was the first expansion’s added dining area. In other words, there’s plenty of room for a proper bar, but instead it’s a head-scratchingly dismal use of available space. So, after what turned out to be 40 tortuous minutes of staring at delicious color photos of the food were were craving, the hostess finally came to get us. “Is the sushi bar ok?” she asked as she led us there. “Do we have a choice?” I asked. The hostess didn’t answer. Perhaps she didn’t hear me. Joss’s sushi bar is cramped. I don’t mind intimate, but it felt like the woman next to me was practically sitting in my lap. But whatever. Just bring on the yummies. Our server greeted us and turned our drink order around quickly. 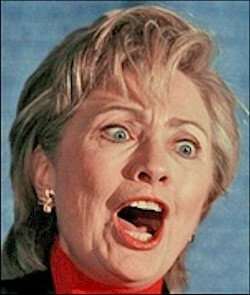 Unfortunately, that was her high moment. The 40 minute waiting room visit had been more than enough time to decide what we wanted to eat, so we grabbed a pen and filled out our sashimi and roll checklist as soon as we were seated: Spring Roll Salad (which is less like a salad and more like big hand rolls) with crab stick, avocado, and an exquisite orange yum-yum sauce that’s to die for, Key West Roll (spicy conch w/avocado), Alaska Roll (salmon, crab, avocado), and crunchy tempura shrimp roll, plus tuna, fresh water eel, and conch sashimi. Oh yeah. Our server continued to pass us by as I sat there with the ready-to-go checklist in hand. Finally, I literally held it out in front of her as she was cruising past yet again, getting her attention like a State Trooper stops a speeding Corvette, and instructed her that we wanted the salad first, as an appetizer. 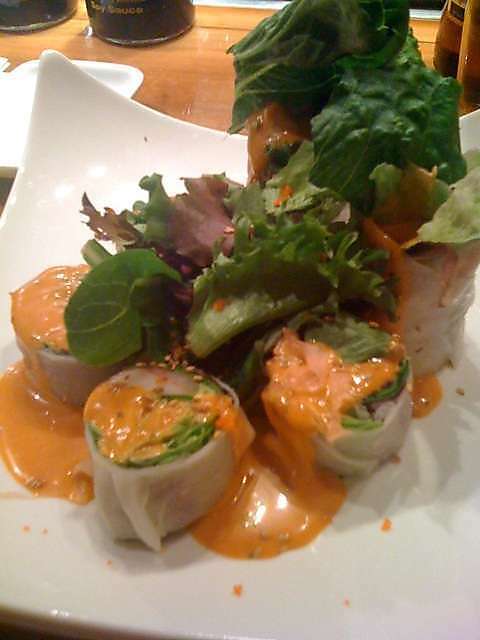 Spring Roll Salad. We could bathe in that sauce. And technically speaking, it did arrive first. Not long after ordering, another server dropped it off between us and disappeared, no side plates, nothing. Yet before we could even discern how to logistically manage the appetizer our sushi showed up, but this time we were quick enough to ask for side plates before they ran off. So there we were, cramped space and two hefty platters of food, trying not to elbow-check the diners next to us as we dug in. Once again, the food was Goddess-worthy. The sashimi was perfect, not fishy in the least, with a nice snap to the conch, and the tuna sweet and meaty. The spice of the Key West roll had real pop, but not overbearing, while our Crunchy Shrimp was lightly battered and crispy, if a tad on the salty side. Nonetheless, it wasn’t long before the sodium, spice, and wasabi kicked in and we needed another round of drinks. Mission Impossible. For all we knew, our server had gone back to school for her Master’s Degree since we’d ordered dinner. We literally never saw her again after I gave her our checklist. No stop by to make sure the order was right, no check in to see how we were doing. Nada. Hell, we made it all the way through dinner and were sitting there, dirty plates and glasses before us, for a good 10 minutes with no contact from anyone, even though the dinner rush had clearly died down by then. Me, I was morbidly curious as to how long they’d actually leave us hanging, but Mrs Bunny took a more pro-active approach, stopping a passing manager and heatedly expressing our disappointment like an AK 47 burst. 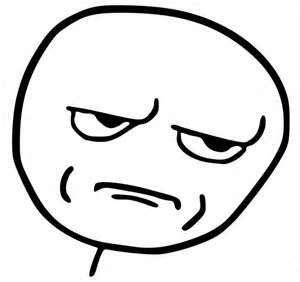 His response after her barrage? “Oh…ok.” And he walked off, perhaps to join our server in search of post-grad education. We don’t know; we never saw him again either. If we didn’t know better, we’d guess that Joss had only recently opened, and had yet to put a concerted customer service training program in place. That’s how brutally and shamefully disorganized it was. So we headed over to that silly server stand thing where you order drinks while you’re waiting, got our check (from yet ANOTHER server), paid it, and left behind the mess that used to be one of our very favorite noshes on the planet. Never again. RIP Joss. We shall miss you. It’s downright ludicrous. As I write this, just after 2pm on Sunday March 3rd, it’s currently 61 degrees in Miami, 63 in Key West, 54 in Longboat (eesh! ), and even just 64 in Havana, Cuba. Here in the Mid-Atlantic it’s a balmy 39 with snow flurries, and it’s sadly obvious that we can’t simply motor south to get warm. 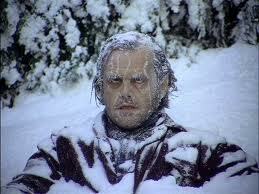 So, this week, we’re headed to seek the heat, since it’s refusing to come to us. Destination: the left coast. 1st up: Palm Springs for the BNP Paribas Open Tennis Championships at Indian Wells, Joshua Tree National Park, and Death Valley (hey, we’re serious about our heat!). 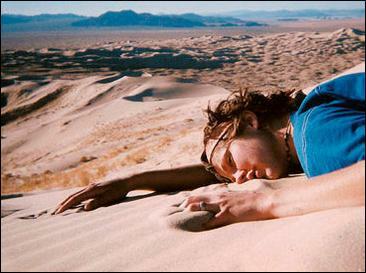 The World’s Best make an annual trip to the California desert every March. Then down to bounce around LA and the Pacific, with a special visit to the Conan O’Brien Show. We’ll show you how to experience the best of SoCal without taking a 2nd mortgage to do it. And we’ll be fantastically, gloriously waaaaaaaarrrrrm again, at the same time our Mid-Atlantic brethren are (possibly) getting pounded by March snow. Sorry, folks. Welcome to Hollywoo’. Wass yo Dream?